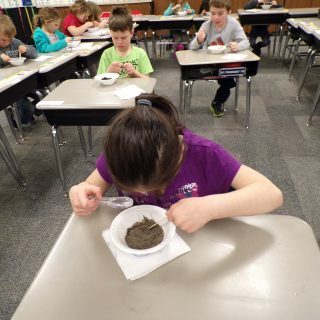 Introduction to Soil and Earthworms: Students are introduced to facts about our soil and our earthworms. 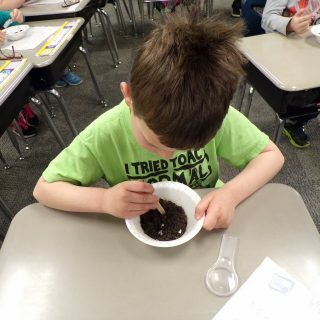 Each child receives a cup with soil (chocolate cookie pieces) and a worm (gummy worm) to eat. They then vote which tastes better – soil or worms! 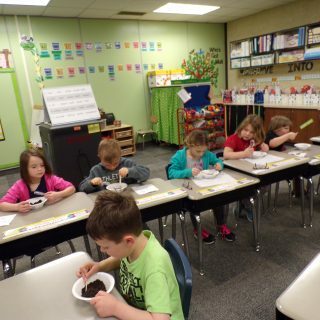 Soil and Earthworms: Students learn about different types of soils. They feel sand, silt, and clay soils and use adjectives to describe each one. They examine a soil sample with a magnifying glass. The body parts and benefit of earthworms is discussed and students examine an earthworm and identify its body parts.